How can you communicate better with the board? Craig Shelley, Managing Director of Orr Group, shares how nonprofit leadership and staff can foster stronger, more productive relationships with board members. He unpacks different board types and offers simple suggestions for executive directors looking to build trust and partnership with their board, and more. Sarah Durham:	Hey! Welcome back to the smart communications broadcast. I’m Sarah Durham and I’m here today with Craig Shelley. Hi Craig. Sarah Durham:	So, Craig and I know each other because we both have the honor of serving on the Association of Fundraising Professionals, New York City Chapter Board. And, Craig, when he’s not volunteering for AFP New York, is the managing director of the Orr Group, which provides nonprofits with strategy, fundraising, leadership, and management solutions. They’ve got offices in New York, D.C., and work with some pretty awesome clients. So, I invited Craig to join me today because we are both interested in getting real with board communications. To kick off this conversation, what we’re thinking about is the difference between performing for your board or putting together content for the board that might be a little bit glossy or sugar-coated versus really getting real and authentic with the board about what’s happening and developing a kind of a trusted authentic relationship. So, Craig, how do you see this topic? Why is this important? Craig Shelley:	I think its everything, right. I mean, if you… when we go into organizations and start to try and understand what’s going on or understand why their not fulfilling their full potential. The board will always say it’s the staff’s fault. The staff will always say it’s the board’s fault. And the real answer, it’s both their faults. You know? The staff hasn’t recruited the right board. The board hasn’t hired the right staff and when they truly partner, that’s when good things happen. And I think, you know, whatever the organization is, if you’re not partnering between the staff and the board at all levels, particularly the CEO level. If you don’t have that partnership, you’re not gonna be able to achieve your mission to the fullest capacity. So when we look around at the things going on in the world, and the things we want to change, and the things we want to improve, the things we want to make better. Our inability to sort of effectively achieve our missions, often times come back to this root issue. We get the board and staff to work together, more hungry people will get fed. More trees will be saved. You know? Whatever your mission is, we can do more of it if you have that partnership. Sarah Durham:	Yeah. And if there’s real alignment, then theoretically, there should be substantive conversations about what’s succeeding, what’s failing, and clear metrics. The Stanford Graduate School of Business did a survey in 2015 of board of directors of nonprofit organizations and one of the key findings was that too many board members lack a deep understanding of the organization their volunteering for. This survey showed that over a quarter of nonprofit board of directors members do not believe that their fellow board members have the strong understanding of the mission and strategy of the organization. And a third are not satisfied with the board’s ability to evaluate the performance of the organization. Do you see that a lot in your work? Craig Shelley:	Hundred percent. And you can see it just by going to a board meeting. Like, I can tell you everything I need to know about a board just by going to one of their meetings, right. So, they’ll be in one of a handful of categories. Either their a listening board which is really this performance board, like where the staff comes in. Sort of does a big performance, puts on a show and the board kind of nods and you know, all of the votes are always unanimous. And you know, you’ve seen it. You know, so that’s one type of board. That’s probably at one extreme. Craig Shelley:	Then you have the reading board and I think we’ve seen these too, where the board members come in and they recognize that they are supposed to own the work or they’re supposed to own the strategy of the organization. So they read basically scripts. So, that’s a different kind of performance, right. That’s the board doing the performance almost for the staff, but the staff is writing the script. Sarah Durham:	And there’s no discussion. Craig Shelley:	There’s no discussion. Right? Everybody reads. Everybody kind of nods. And again you mostly see those unanimous votes. Craig Shelley:	Then you have the reporting board, which is probably the most common now days, I would say. Almost 20 years ago when I started, the only boards I saw were these listening or reading boards, but now you’ll see more of these reporting boards. So the boards would work off of, you know kind of bullet points that the staff prepared. And you can tell it. So they were involved and they understand the work enough so they can kind of riff on it. But, they’re not fully owning it. Craig Shelley:	And the last, you know, stage I would say, “Like okay.” You go into these board meetings. It’s rare, but you’re blown away and typically they’re very high performing organizations. It’s really discussing boards or partnering boards. But they really are owning their issues. They’re unpacking them. They’re diving deep on them and they’re having rich, substantive conversation. And making substantive decisions. Oftentimes, you know with a little give and take and little compromise and quite a bit of disagreement now and again. As a CEO, a CEO of nonprofit before I came to Orr group, that’s the most difficult kind of board to manage, but that’s the one that you’ll get the best results of. Sarah Durham:	So, you articulated four different types of boards: listening, reading, reporting, and partnering. Are those life cycles? Does every board move through those stages, or could you in a younger organization develop a partnering board early and what would be the pros and cons? You know, you said a partnering board can be challenging. Unpack that a bit. Craig Shelley:	Yeah. you don’t have to go through the stages. Right. You don’t have to start as one to become another. A lot of it comes down to the culture. A lot of it comes down to how you communicate with the board from the first day. How you recruit them. The types of people you recruit. So, often you’ll actually see younger organizations will tend to have more of that discussing or partnering board. And where that can get a little dangerous. As, you know, you still have to, sort of box out. You know, the board’s responsibility is vision, strategy, direction, and big decisions. You know, its not how much toner we should order for the printer this month, really. So you have to kind of have that line. And sometimes when they start discussing, they can off in that direction. Sarah Durham:	Veering into management versus governance. Craig Shelley:	Exactly. So you have to have either a strong board chair or a strong CEO or preferably both. They can kind of keep them focused and say “Yeah. We wanna dive deep. We wanna talk about these things. We want your opinion but we don’t want need for you to pick the art that hangs in the lobby.” That kind of stuff. Sarah Durham:	So, how would you encourage a nonprofit to foster a partnership with the board? And I assume a lot of that comes down to the CEO relationship, but also other staff people. How can the whole organization develop a more real collaborative partnership with the board? Craig Shelley:	First, I mean, you have to be telling one story right. What the CEO says to the board, has got to be what they say to the staff, has got to be what they say to the public, has got to be to their donors. But to me, it starts with having like a discipline in the cadence in which you communicate to the board. It took me a while to figure this out when I was doing this type of work more directly, but it was, you know, every month my board heard from me, personally as a CEO, three times. When our finances were closed for the month before, I sent those around with a detail of like, hey. This is what’s happening, very transparent, very honest. You could have your CFO write that, but I’ll be honest, as a CEO, I thought it was more important for me to understand and be able to articulate the what was going on with the financials. So I wanted to do it that way. So I was very dry, very boring. But for the accountants on the board, for people that cared about that stuff, that was good. For everyone, it fostered a sense of ownership of the finances, right. It wasn’t the CEO’s problem. It was our… these were our books. These were our finances. Craig Shelley:	The second thing, I always like to at least once a month shoot out a quick email with just some piece of good news. If you’re a nonprofit CEO, you probably finding joy two or three times of week in your work. The board members aren’t seeing that. You have to have sort of off the cuff and authentically share that with them. But don’t do it everyday. That would get a little bit annoying. So once a month I always tried to make it a point to share a story. I was a CEO of a local Boy Scout Council. So I met such and such kid at camp. Or, I went to this Eagle Court of Honor. Or whatever it was. I just sort of shared that nice feel good story. It kept tied emotionally and then again engaged. Craig Shelley:	And then the other thing I would do every month, I would send out a longer form, two to three page sort of memo that just hight lighted all the great things that were going on: programmatically, financially, fundraising wise, something good going around the office. Whatever it was, but made it a point in there to call out the staff members that were responsible ’cause I would also circulate that out to the staff, which I think is important in terms of telling ones story. And also call out board members. I was very generous in praising board members. So maybe that board member wasn’t really all that involved in why we closed that gift, but they were helpful. But I was sure to note that so board members started to see, “Wow. People are doing things. People are involved.” Oddly enough with those three simple things, you started to see the board really come out. Get more engaged. Craig Shelley:	Then there’s, you gotta meet with your board members all the time, regularly. You know, once or twice a year you should see each one of your board members and really talk. Not with an agenda. You’re not selling them anything. You’re not asking them a specific question. Just talk about what’s on your mind and engage them. So those are the things I think a CEO can do to communicate with their board in a way that leads towards this sort of discussing, partnering, engaged board. Sarah Durham:	I think there’s kind of two threads that run through your recommendations here. One is the importance of celebrations or wins because if we’re gonna deliver bad news, which inevitably were gonna have to do to the board, we have to also good news. We have to put things into the bucket so that when we have to take things out of the bucket, there’s something to draw on. But the other is I think that the kind of candor that you’re talking about, particularly in the financial email and in the email that sounds to me almost like a state of the nation or state of the organization on a monthly basis is that your building a type of trust or demonstrating your own integrity as a leader. 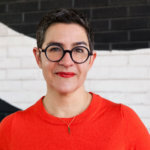 Sarah Durham:	This is one of the things that I’ve observed with a lot of organizations and experienced actually being the executive director of another board that I serve on, which is that when the CEO or executive director or staff say, “You know, this thing is going on and I’m not actually sure how I’m going to manage it. Or, I’m feeling really good about this part of it, but I’m concerned about that part. Or, I wish I had done this a little differently.” Oftentimes those kinds of confidences are not shared publicly. They’re shared in a one on one. But they are hugely trust building to the board members because what they say to the board member is this is a person who’s not afraid to be real about where they’re succeeding and where they need help. And, that as opposed to a CEO who feels like everything has to be good news. I think a sophisticated board member and the kind of board member you’re describing who wants to serve on a partnering board understands that it’s not all gonna be rosy and that the most trustworthy leader for the organization is the one who’s not afraid to admit when things aren’t rosy. Craig Shelley:	100 percent. I worked for some amazing leaders early in my career and learned a ton. But one of the things we had a really bad habit of doing, and I say it now. You know we’ve worked with lots of organizations. We put people inside of organizations as CDOs, CEOs, major gift officers. A lot of times you’ll see this bottle neck of we can’t tell the board that. I can’t think of a lot of things you can’t tell the board. And, in fact as soon as you say you can’t tell the board that, that probably means you need to tell them quickly. ‘Cause that’s in a chat. You know, you’ve come across something that’s reputationally harmful. But, yeah you have to have that dialogue and you’re right. Every time you tell them the good news, your putting sort of money in the piggy bank that you’re gonna be able to withdraw when you have to tell them the bad news. But you have to, I mean boards are there. They are on the hook. They are on the line. They want to lead these organizations. They understand things aren’t perfect. But, yeah, you have to be able to tell them when things aren’t going well. If you’re gonna run out of cash in two months, don’t wait ’til two weeks out to ring that alarm. Sarah Durham:	Right. So candor is how you build trust. We had a situation once on a specific project where we were presenting some work to a board and we had a conversation in advance with the CEO. And she said, “I’ve got a great working relationship with the board. What we’re gonna do is we’ll go in and I’m gonna tell them exactly what I need.” And we walked into this board meeting and she said, “Look, we hired these pros and here’s what we’re gonna present. Here’s what we need your feedback on today. Here’s what I don’t want your feedback on today.” She really laid it all out in very direct and candid terms. In ways that I think many CEOs would hesitate to speak to their board. But this was a board that was a partnering board and they were actually huge business tycoons in this meeting and they loved it because they knew what was expected of them. They trusted her. And the meeting went off beautifully because she was very clear that she was running the meeting and what she needed from the board. Now, that wouldn’t work on every board perhaps. But I think that that’s a great example of what can actually emerge in more of a partnership relationship. Craig Shelley:	Definitely. And you don’t see that, right if you have these boards that sort of just listen. When there’s a problem, they look at you and they expect you to solve it and you know we have lots of talented people running lots of great organizations. But the board members, by large, have a whole different skill set than most of us that have spent the majority of our careers in nonprofits don’t have. So to be able to access their talents, their smarts, their brains. I mean, first and foremost I’m a fundraiser, so I always want to aces their wallet first but board members have a ton to offer and we do ourselves a disservice if we don’t allow them to offer. Sarah Durham:	If your trying to build a partnering board and your trying to access what your board can bring to the table, how do you use a staff person ensure that that doesn’t cross a line into management or hands on. I think a lot of nonprofit staff people are wary that if they go to that board member and they say, “Hey, I know you’re an expert in xyz, can you help me with this?” That the dynamic will shift. I mean, it always seems to me that in the moment where you engage a board member outside of the board meeting in some ways you’re asking them to take off their governance hat and start being a volunteer. But they’re an exceptionally powerful volunteer because they do also have that board members hat. How do you recommend staff manage that? Craig Shelley:	That’s a challenge, right? I’ve always tried to force their relationship at least between the senior staff on the board because I think that that’s, you know, really important. But I recognize why there’s a little bit of discomfort there. You’ll see a lot of times CEOs say, you know, we work with some now and I respect and I understand it where they say, “I communicate to the board, you guys don’t. So you communicate through me.” End of the day, the board is the CEO’s boss. One of their main responsibilities is hiring and firing the CEO. So I get it. But you have to hire the right people, have enough trust, have enough faith where you can allow them to have those relationships. Craig Shelley:	So I think if your working with the board that has a full picture of what’s going on and you’ve opened up and said, “Hey. This is my Chief Marketing Officer. This is my Chief Development Officer, my Chief Operating Officer.” Whatever it is and you foster relationships at that level and its clear this is sort of the roles and responsibilities of the board members, a staff member can communicate honestly and openly with board members, get their advice, get their input. That’s gonna be far more effective than again having this performance or this show. Craig Shelley:	But how do you keep them from crossing the line and getting beyond where you want them to play. A lot of that is culture from the top, right. So if you have a board chair that tends to come into the office and you know, pick out the paint swatches, when you go to your board member who works at an ad firm and ask their opinion about the marketing pieces, they’re gonna start thinking that they can run the shop, right. So you gotta set that tone from the top. The chair, I think, has to be very clear like, “These are the things I’m involved in. These are the things I’m not. These are the things I advise on. These are the things I make decisions on.” And then if you have a board chair that does that, that should trickle down. If it doesn’t, then you get into one of these situations where a board member starts to step over. If you have that right kind of board chair, they can have that conversation and say sort of, “Look, you know we really appreciate your help. You don’t need to go that far with that.” You know, give them your advice. Give them your direction. We hired them. Let them actually run it. Sarah Durham:	I think it’s useful also to literally use the language of “I’m taking off my hat” as a board member and putting on my hat as volunteer when I’m serving in a voluntary capacity. I always try to say that out loud. Not for the staff person, but for me. But also, I think it’s important for both of us to remember that when you stop governing and you start volunteering, you work for the staff person. Sarah Durham:	The dynamic has shifted and they should be leading the dance. Which is still tricky, but certainly important to do. So if staff people like a Chief Marketing Officer, have access to the board, how can they help facilitate strong communications and more of a partnership model? What should they do? Craig Shelley:	I think that’s very much rooted in telling one’s story, right. So, if you’re telling the board and staff the same story, all they have to do is keep singing from the hymn book that they were already singing from rather. There’s no need to be, you know, let me check with Sarah before I talk with the board member to make sure that they know about xyz. Now if you have that sort of relationship with your board as an organization where the things are open, transparent there’s really almost nothing that a staff member could get into a conversation with a board member that would make me uncomfortable. Now if you haven’t told the board that you’re gonna miss your fundraising goals or you haven’t told the board that your biggest annual donor decided not renew. Or, you haven’t told the board that the state has closed down your camp, then you have to worry about what the staff is going to say to them. But I think again, its all rooted in telling that same story. And again, more and more, people don’t think of this but right. Craig Shelley:	Like, so their communications team is telling a story on social media with their mass emails and their newsletters whatever it is, and then the CEO is managing and telling a story to the board. You may not think of your average board member as someone that’s out there on Facebook and Twitter following your organization, but I’d bet you good money that they are. So they’re hearing both of those stories. Those are not the same story, you’ve got some ‘xplaining to do. So you have to have the same story. Sarah Durham:	Your organization, the Orr Group, has a lot of people in different organizations, doing interim or foundational director development jobs and things like that. So you see first had a lot of organizations how other board members communicate with staff and staff communicate with board. Can you give me an example or a couple of places where you think organization staff members do that really well? An organization that you think does a couple of things at the staff level that really help facilitate a partnership with the board? Craig Shelley:	What I’ve always liked to do, and I see this in a number of organizations and I think it is real effective is you sort of marry up board committees with different staff members, right? So if I’m the communications committee of the board, that should be staffed by the staff from the communications department and vice versa with development, with finance, with things like that. And as a CEO I think you do the board members and the staff a disservice. Your sort of in the weeds on all those committees and you have to be willing to step back. Allow your staff to kind of run those committees and you know. I hate committee meetings. I hate meetings generally, but you have to have committees. That is a great way to sort of get your board engaged. You don’t have to have the standard ten committees because that’s what it said in the textbook. You know, have the three or four committees that make sense for your organization. Let the staff staff them. Let them build their relationships with those board members on that subject where they are the experts. And let that sort of bubble up to the board. So I think that’s one way to make sure that there’s really good relationships between board members and staff. Craig Shelley:	Another is, you know, for CEOs to signal that they’re comfortable with that, right. To sort of not be in the room. We have an organization we work with now, which is fantastic and their going through a pretty complicated sort of where do we go from here strategic discussion. And its been fascinating for me to watch the CEO doesn’t go to the main conversations with the board on this. Its the COO, one of their other senior leaders and occasionally, you know some others that come when it’s important for that topic. But she’s not there guiding the conversation. She will input on the conversation after that have sort of bubbled up somethings and they’ll have some dialogue. But I mean, she is really trusting the staff department with the board members, who FYI also are biggest donors. And so you know, FYI her bosses, right. Letting them partner to sort of figure out the direction as opposed to tightly managing it. To me, if I’m a board member, that says like, “Hey. I can trust the staff. I can deal with the staff. This isn’t a one woman show. This is truly a team that’s running this organization. And I’m on that team. Sarah Durham:	That’s awesome. I mean that signals such huge trust when a CEO is comfortable letting those conversations happen. Another thing I think comes into play with this kind of communication is just literally the rapport you have with the board members and how you follow up. So if you’re in that meeting with a board member, they ask you a question. You don’t know the answer, but you take a note and get back to them and you email them and say, “I found out the answer. Here’s the answer.” You’re sending a signal that you close the loop and that you’re thorough. Or, if there’s an action item that comes out of a board meeting that lives with your department, to close the loop on that and to make sure that it surfaces or to say, you know to circle back in subsequent conversation. I often find that there’s very little types of tight follow through and kind of good manners communications. Actually, also have a transformative effect. So, perhaps for the CEO, but more so for communications staff or other staff people. Because, it signals that they’re capturing the details, listening carefully, and following up. Craig Shelley:	Oh, 100 percent. I think you wouldn’t just say this for board members. I’d say it for any donor, any stakeholder. I’d probably say for any person. If I have a conversation with you and I say I’m going to do something, you better do it, right. And like, that obviously I think that goes for anybody, but particularly it goes for board members. And when you close that loop, you know if you close it in an email, you know copy the CEO. Just so they kind of see. They know the loop is closed and I would also tell you as the CEO, I never had any issues with my staff talking to the board, but I did like to kind of be in the loop on it. You know, I like to sort of see the emails. I’d like to be somewhere in the hall for you to mention, “Hey. I just spoke to such and such.” ‘Cause that allows me to sort of provided the freedom to the staff to do that and know I’m not going to get blindsided. And be like, “Oh, I was just speaking to such and such and they told me xyz.” I don’t mind that they know xyz, but I probably want to know that they know xyz. Sarah Durham:	Great. Craig Shelley, thank you for joining me. Outro:	This is a Smart Communications podcast. Developing the voices of determined nonprofits. Brought to you by Big Duck. Speaker 2:	Big Duck is an agency that puts Smart Communications in the hands of nonprofits. We help our nonprofit clients develop strong brands, strong campaigns, and strong teams that advance their missions and achieve their goals. Connect with us at bigducknyc.com. How can you facilitate better internal communications? For nonprofit leaders, it’s vital to communicate effectively with staff, board, and other stakeholders in order to carry out their vision for the organization. Listen for tips on how to do just that. How can nonprofit communications leaders collaborate more effectively? Elise Dowell, Vice Chancellor for Communications and External Affairs at The Jewish Theological Seminary, shares the lessons she's learned about collaboration as a nonprofit communications leader. Should you fire that lousy board member? A shared understanding of governance is the key to a strong nonprofit board. Simone Joyaux, author of “Firing Lousy Board Members” defines what that means, why it matters, what it takes to get there. How can you facilitate great internal communications? Communicating well internally can help your organization communicate well externally. Listen in for useful tools and practices to facilitate productive conversations inside your org.